How can I repair a pasta maker that was washed with water and has started to rust? My girlfriend has a pasta maker, pictured. After using, clean with dry cloth or brush. Occasionally apply a few drops of oil to cylinder ends, turning cylinders to distribute oil evenly. Never use water on this machine. 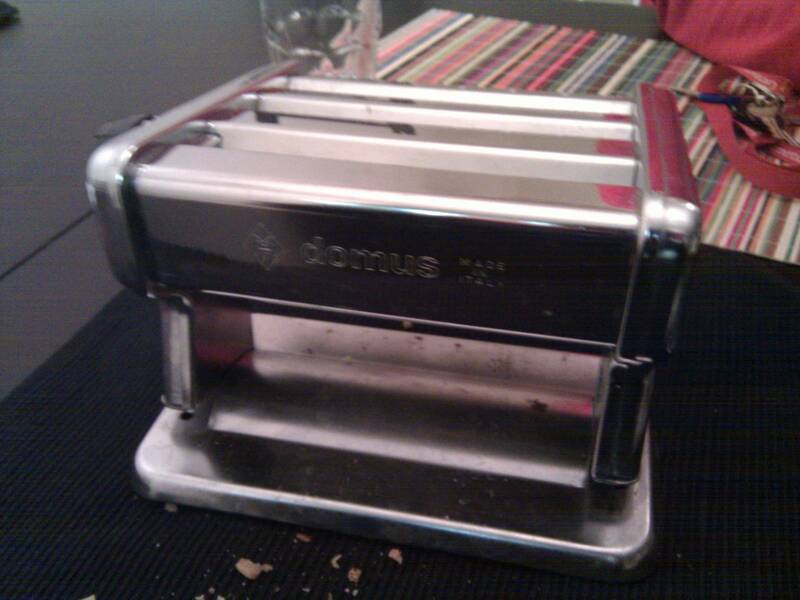 Is there anything I can do to recover the sanctity of my beloved's pasta maker? I'd start by making up a batch of sacrificial pasta that you can run through the roller and the cutters. This will pick up any remaining moisture, remove any rust particles that the cutters knock off each other, and give you a better idea of how bad the damage is. If the cutters still cut cleanly and the damage is mostly cosmetic, that's good news. You could try to remove rust by carefully applying something like a non-scratch Scotch-Brite scouring pad, but I'd avoid abrasives like steel wool. You want to be careful to avoid making the problem any worse than it is. If the cutters no longer cut cleanly, it may be time to look for replacement parts. If you can locate the manufacturer, that's your best bet for getting proper parts. You might even be able to send the machine back to be refurbished. Check the instruction manual, if you have it, for an address, phone number, whatever might help. If that's not an option because the manufacturer is out of business or whatever, look for similar machines that you can use for parts. Maybe you'll find a Domus machine on eBay that has a good set of cutters. Carefully measure the width of the cutters and check other machines -- it may be that the cutting rollers from an Atlas or Imperia machine will fit into your Domus. On Valentines Day, no less! Shame! The good news is that I think it will be fine. Just some surface rust on the cutters and loss of lubrication on the moving components. I would start by cleaning with a sponge and some Bar Keepers Friend. It usually handles surface rust pretty well. If that doesn't get it all, you could try a stronger chemical like CLR (Calcium Lime Rust), or you could use some 0000 or 000 steel wool from the hardware store (0000 is very fine, 000 is fine). Rub the rusty rollers firmly, adjusting the rollers to get all the corners. Go slow with abrasives on the chrome covers - 0000 steel wool is fine for chrome if it has any surface rust, but 000 or 00 could dull the chrome if used aggressively. For the lubrication, use whatever oil is recommended in the manual, or any food-grade mineral oil (usually sold at kitchen stores for general lubrication tasks or oiling wooden utensils). Just put a few drops on each moving part and move the rollers to distribute. Wipe off any excess with a cloth. Put the pasta maker in a bag of rice for a few days to make sure all the internal parts are good and dry. This will help avoid additional rusting. Then follow Sam Ley's answer to clean up the existing rust and lubricate. 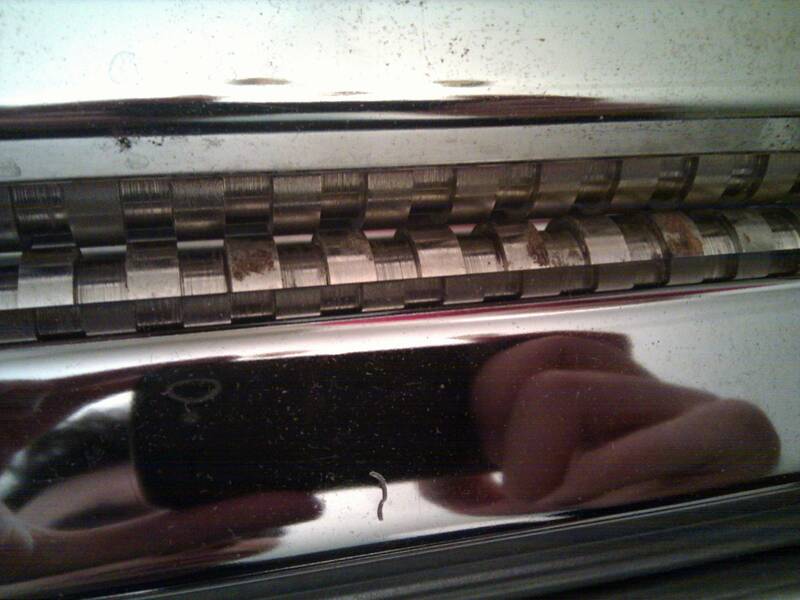 Point 2 You'll have to sacrify some pasta, maybe putting the same pasta severa time in the machine in order to clean it. The best of all will be if you fully disassemble it first and clean only press and cutters but if you can not I think you can use Coca cola to remove the rust. Then clean it with antibacterial towels and probably with some alcohol. After clean with dough and wash it with some boiling water, holding upside down but only the press and cutter not the mechanism) and dry with towels and after with hot air (you can use fan). At the and use some dough containing vegetable oil to oil the press and cutters and clean it again. I believe it will help. I cleaned my marcato yesterday and did all this but without coca Cola because mine was not rusted. There are a lot of videos on youtobe showing how coca cola is cleaning rust so I think it may work for you too. Not the answer you're looking for? Browse other questions tagged equipment pasta or ask your own question. Can I repair a cake tin which has started to leak? (How) can I prevent pasta water from boiling over with the lid closed? How to mix pasta and sauce evenly? Can water in which pasta was cooked be used to make gravy? How do I clean a pasta maker? How much water to put in my pasta pot? Worried about raw eggs, Salmonella, and pasta maker. Can I blend pasta and add water to make bread or pizza dough? Should pasta be started in cold or boiling water?